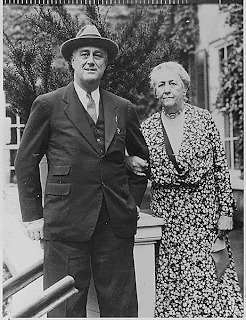 In keeping with Inauguration Week festivities, this Friday's Famous Foodie is none other than FDR's mom, Sara Delano Roosevelt. You know Franklin didn't cook! In 1879, her favorite Aunt Sarah gave Sara Delano Roosevelt a small notebook with less than 200 pages. That year she began a household notebook which she relied on for 50 years to run her various homes, including Hyde park. In 1950, Clara and Hardy Steeholm annotated the household diary, giving the reader a picture of life within the Roosevelt house. 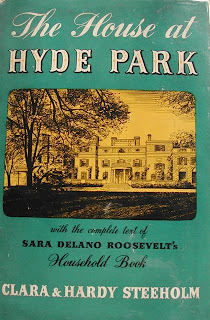 Their book, The House at Hyde Park, offers a unique insite into the formative years of Franklin Roosevelt under the doting and stern eyes of his mother. Sara collected recipes from friends far and wide. This recipe, she notes, cam from William Yapp, a porter on the D & H car. Her husband was a director of the Delaware and Hudson Railroad. He and his family traveled in a private car on the D & H, know as the Monon. William Yapp was the cook and porter for the private car. 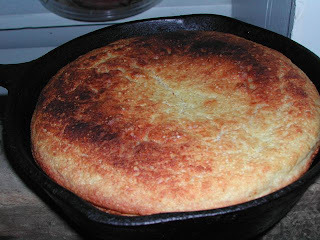 He made a cornbread or egg bread for the Roosevelts and later gave the recipe to Sara. She notes that Yapp called it egg bread but she lists it as cornbread. An egg bread usually replaces the milk with eggs only, so perhaps in formally setting out the recipe for Mrs. Roosevelt, Yapp gave her a more refined recipe. 1 teaspoon of baking powder then beat in 3 eggs. beat it up, grease the pan, pour in an inch deep - bake 15 minutes in a quick oven. Today, we have self-rising corn meal and there is no need to boil milk, but I must say Mr. Yapp's recipe has changed little in all these years. Check out the Cookbook of the Day blog for the entry on Martha Washington.